Headquartered in Corpus Christi, Texas, Repcon, Inc. also has four offices in the Texas/Louisiana Gulf Coast and West Texas regions. 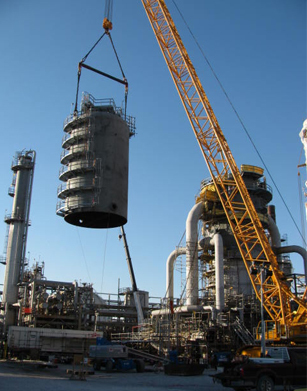 Repcon primarily serves the refining, petrochemical, chemical, and midstream industries. Over the last thirty years, we’ve served the vast majority of the nation’s refineries and petrochemical facilities. Repcon provides turnarounds in most process units in refineries and chemical plants and is the pacesetter for Specialized HF Alky Turnaround Services. Our experience also leads our industry in industrial construction services, revamps of existing units, and new grass-roots construction projects. We normally serve as an Industrial General Contractor, providing complete turnaround and construction management, planning, and execution services, including subcontractor management. However, depending on an individual client’s needs, we sometimes only perform specific portions of turnaround projects, such as heat exchanger or tower work. Repcon is known for its expertise in planning and executing critical projects safely, efficiently, and on schedule. Repcon has been recognized for its outstanding safety record and been awarded the prestigious VPP (Voluntary Protection Program) Mobile Contractor by OSHA, a highly sought after status Repcon has maintained since 2005. At Repcon, we pride ourselves on safety, quality, value, integrity, and professionalism. Our mission is to provide a level of quality and value that is unmatched in our industry and to do so while maintaining the highest regard for safety and the environment. Our employees are well trained and well supported, and we know that we cannot execute our mission without them. To that end, we invest a lot in our employees, and our Employee Development Program ensures they have the best training available to successfully execute their job assignments. Our training plans included the latest research for management personnel and supervisors, technical and support groups, administrative personnel, and craftsmen. Repcon provides its team members with the knowledge and skills to be safe and productive and to make sound decisions no matter what scenario arises. In order to offer our employees the very best training available, we work closely with the Contractor Safety Council, the Craft Training Centers, Associated Builders and Contractors, Inc. (ABC), the Business Roundtable, the National Center for Construction Education and Research (NCCER), and other professional training and educational organizations.